Sometimes things take longer than anticipated. And this is definitely the case for my USB MSD Host project where I wanted to use a USB memory stick with the Freedom FRDM-KL25Z board. But finally, I have things working. At least most of the time …. The USB MSD (Mass Storage Device) class is designed to be used for things like diskette drives, hard drives or memory sticks. To attach a memory stick to the USB bus, the memory stick is usally a USB device, and the other side needs to be the host. The first barrier to overcome is the FRDM-KL25Z board does *not* give the needed 5V to the USB bus which is required for the host mode. To overcome this, I’m using a patched USB cable as outlined in this post. While it is possible to use the MSD device as a ‘raw’ device (doing raw block read/write operation), the usual way is to use the device with a file system on it. I’m using the open source FatFS with SD cards successfully already in many projects, so I decided to use FatFS in this project too. While it is possible to add USB MSD Host support in bare metal (without RTOS), using an RTOS makes it much more convenient and less complicated. I have ported the Freescale USB stack for this project. While the stack itself does not assume an RTOS, many aspects of the stack like memory management or periodic polling of the USB device block are handled in such a complicated way, that I think using it without the help of an RTOS makes things really difficult. Especially the dynamic memory management in the USB stack had many inconsistencies, and to track potential memory leaks the help of FreeRTOS was critical. So this is what I ended up using: FreeRTOS. After initialization using FsMSD1_HostInit(), it periodically calls the polling routine FsMSD1_AppTask(). CheckStatus() is used to print a message if a device is attached or removed. The “Host” task is running with a higher priority to make sure the USB bus is served often enough. Because some of the FatFS shell operations like to copy a file are using a local buffer on the stack, the task stack size is higher than for the other tasks in the system. That means that the USB stack has allocated an extra amount of 3160-2528=632 bytes. Removing the memory stick will free up memory again up to 3072 bytes free bytes, and will go back to 2528 bytes with the memory stick attached. I’m still not sure why it does not free up all the memory, but at least there is no memory leak. I still will need some time to understand where and why the USB stack needs the dynamic memory allocation. The full source code and Processor Expert components are available on GitHub. The example project shown here is as well available in this GitHub repository here. This entry was posted in Boards, CodeWarrior, Embedded, Embedded Components, FatFs, FreeRTOS, gcc, Kinetis, KL25Z Freedom Board, Processor Expert, USB and tagged arm gcc, CodeWarrior, codewarrior project, Eclipse, Embedded Component, freedom board, FreeRTOS, gnu gcc, KL25Z Freedom Board, open source projects, Processor Expert, software, technology by Erich Styger. Bookmark the permalink. Excellent, I ussually came and check what are you doing, great stuffs!! thanks for sharing your projects!! You are using the freescale usb stack with freertos. 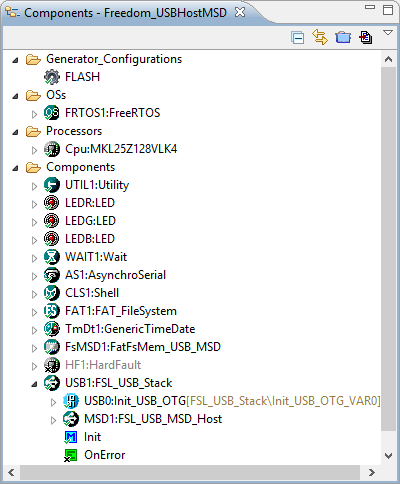 Is there no standard usb stack for freertos ?? From what I can tell most of the freertos demos use a ported usb stack for the micro architecture (e.g. LPC, Freescale, etc). It would be good if there was a more standardised usb stack for freertos which driver support for the various micros supported by freertos. The freescale usb stack is for no OS. I think this is used in MQX and/or MQX Lite, so I imagine it should be ported in a similar fashion for FreeRTOS. i.e. similar use of tasks, rtos services, etc. Hi Simon, I would *love* the fact if there would be a standard (open source) USB stack. That way this would be used as stanard with FreeRTOS. But I’m not aware of any which has been ported. There are bits and pieces, but not something working? As for the stack itself: there is not much you need to have it working with an RTOS, so no dedicated support needed. And if, I can easily add the FreeRTOS functionality (as I did). Hi Erich. I am grateful very much for your work. it’s very useful for me. I am new enough working with Freescale. I have tried to adapt your program to my MCU, K60, but it gives me some mistakes. It does not recognize me the FSL_USB_MSD_host in USB’s stack. The error is ” No inherited component assigned” in the MSDHost module. Other examples and programs I could have adapted to the K60, but this one gives me always mistake. Thank you!! As for the MSD Host mode: I have tried it on KL25Z only so far. I’m sure that probably I have missed to include something to properly support the K60N512 (the one I have). Let me see what I can do for you over the next couple of days. But I think that I might have missed some files/settings to properly support the K60. Sorry about that, as I needed it for the KL25Z only so far. But I’ll look into it. ok? I worked on the USB MSD Host stack most of today. The good news is: that error your report should be gone. The bad news is: it does not quite work yet. It raises an interrupt when I attach a memory stick, but it does not properly enumerate. Not sure what the problem is. I think I’m missing something in the driver. Thanks a lot Erich, I prove it now. Is there a method (or work around) to change the device class selector in the latest FSL_USB_Stack from a device to a host, or a host to a device? no, I don’t think so, as the code behind device or host class is very different. Your blog is a great entry point to freescale and CodeWarrior. I tried to adapt the program to a K20 using the K60 selection on the FSL_USB_MSD_Host. There were no issues getting the components installed, and the project compiles without errors. The issue is the drive does not properly enumerate. After reading all the comments, I found a similar issue when using a K60. Do you know if anyone has found a solution for this issue? no, I don’t know that the issue could be. I have used the MSD host only with my FRDM-KL25Z so far. I do have a FRDM-K20D50M, so I might try it on this one. I think it would help. I would expect the USB architecture of the FRDM-K20D50M to be close to the MK20DX256Z. I started working on porting things to the FRDM-K20 board. I have made good progress today, but I need to see if I can find time tomorrow night on it. I’m interested in USB MSD device bootloader, to programm MCU just by drag and drop binary file from host PC. Is it possible to do so basing on your host implementation? Did you made some attempts to implement such functionality and can you give me some advice how to bit it? yes, I have implemented such a MSD bootloader which enumerates as a memory stick, and then I can copy files to it to program the board. I have done this for the JM128 on the TWR-LCD board. I have no done this yet for Kinetis. Thanks, it might be good starting point. Hi Erich, have you read application note AN4368 from Freescale? It’s the same as your MSD host bootloader, but for K60 family. The code of AN doesn’t use RTOS. Have you made some comparisons between the two results? For example, is your solution more code efficient? yes, I know this AN4368. But there is one thing: I do not use an RTOS for the bootloader neither. The application presented in this post is not the bootloader, it is the application which is implementating USB MSD host. A bootloader typically does not need an RTOS. The difference between AN4368 and my approach is that I’m using Processor Expert, which allows me to easily port my bootloader to different devices. Each approach has its pros and cons. What about the code size of your bootloader? It only takes 8 KByte in total. USB_MSD_HOST_MQX_Lite_MKL25Z128_PEx example,in the USB stack 4.1.1. In debug it stucks in HardFault. Following your teachings i used the HardFault bean to analyze it,but strangely it mades everything working ok.I guess this fact deserves further attention. has references to freeRTOS.h for malloc functions etc. At this point i dont know ho to move. Can you help me about it? In which file did you had that reference to the FreeRTOS memory manager? I have it running on my side without FreeRTOS too. Please could you attach or link the project you ìre talkng about? Hi,where is “FRTOS1.h”? 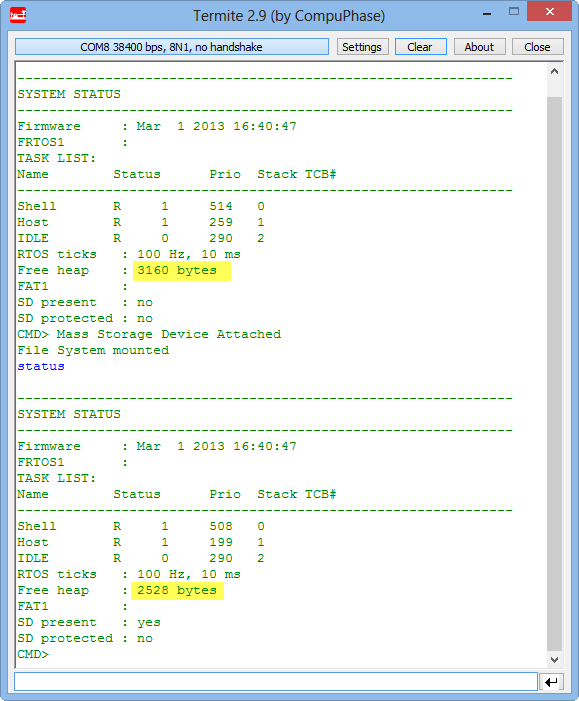 I use your Freedom_USBHostMSD project in IAR,but 171 errors finded,Can you help me? I use FRDM-KL26Z+IAR+(your PE project). I add the components in PE from your PEupd folder,it’s ok. But when i make the project,more errors generated. what can I do next step? I do not have this on my side, but it looks like your IAR compiler does not find the header files/include files. It might be a bad idea to start with IAR tools if you are not familiar with it, as this IDE might not be something easy to start with as a novice, especially as IAR does not integrate in a seamless way with Processor Expert. Have you considered to use Eclipse/CodeWarrior/KDS instead? Then you would not run into these kind of issues. I’m using the GNU ARM Eclipse plugins (http://gnuarmeclipse.livius.net/), and not the orphaned CodeSourcery ones? CYGWIN environment variable option “nodosfilewarning” turns off this warning. If it finds Cygwin tools, that would be bad. I have not installed Cygwin, as it is source of all kind of strange problems. The issue is if gcc finds something with cygwin, then it will try to use it with bad side effects. So if you have Cygwin installed (e.g in C:\cygwin), rename that folder so it is not found any more. Maybe this helps. I had similar problems when I created a bare SDK project from scratch (see https://mcuoneclipse.com/2014/06/15/tutorial-diy-kinetis-sdk-project-with-eclipse-startup/). I had no time yet to port this USB project to bare Eclipse, but looks I should. Could you try adding -specs=nosys.specs to the linker options (as outlined in above post)? you need to enter the module name as listed in the ‘help’ command, e.g. I want to creat a msd devise with kl25z is it possible? About FAT_FS lib, there are any command to create a file, write data and close the file? I try to substitute the VNC for KL25Z, but I need this functionalite. True, I have not done that (yet?). no, I have not done that (but should not be too hard ;-)): use the FRDM-K64F as USB MSD device with running FatFS with the SD card. Would be a nice week-end project (but I’m booked out for the next weekends). Just wondering if the project files (tutorial steps) are up to-date with the latest processor expert version. I would like to try your example project on a newly acquired FRDM-KL25Z board..
Any recommendations and pitfalls to avoid ?? The project and tutorial steps are still the same, or at least I cannot remember anything special. The only thing I know is that some USB memory sticks cause problems. Sticks with less than 4 GB worked very well, while somehow sometimes sticks with larger capacity cause problems (not sure why). The board revision should not matter (I hope), the latest FRDM-KL25Z I have is the Rev E. one. Just make sure you properly power the 5V to the USB port. And that you do not consume too much current of course. Otherwise let me know and I see if I can send you a project with all the files. Thanks for your quick reply…I’m using IAR development tools and I’m fairly comfortable using them. I have implemented code for the ultra small KL02 processor without using Processor Expert. For this project, If you do have files for the IAR tools then I will appreciate you make them available otherwise could you advise on porting your source code to IAR tools or any other tool in general. I will try to read up on Processor Expert and IAR to port your project files. Any help/recommendation will be much appreciated. we are not much using IAR, except the code size limited (free) version, because it is too expensive. Porting to IAR should not be a big problem, I try to have my sources compiler neutral as much as possible. But you need to watch out the inline assembly code (or guard it), as IAR is using a different syntax. The other thing ot watch out is to properly allocate the USB buffers to a 512 Byte boundary. Yes, the USB stack I’m using is a legacy one. 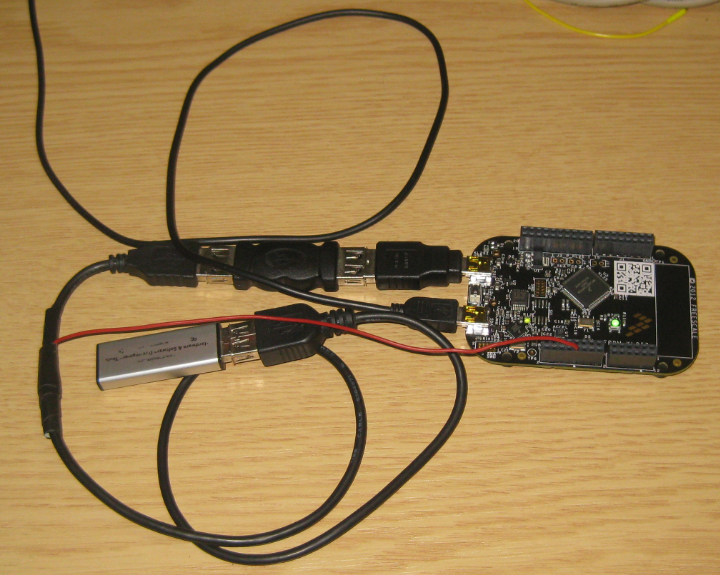 Freescale (well, now NXP) moved to the USB stack inside the Kinetis SDK. I’m still using that legacy USB stack because it worked very well for me. But in your case you probably go better with the stack in the Kinetis SDK? Did you notice that ever? Do you know whats happening? you need to find out which interrupt is causing this. See https://mcuoneclipse.com/2012/02/20/oh-my-an-interrupt/. Thanks what the hardfault tells me. I tried to change the micro controller to make sure it was no broken, but still the same. What should I do now? Not sure out of my head what that assignment does. But it sounds this turns on some hardware which then causes the hard fault. Is your USB descriptor at the right place? Hi! I got the problem solved. On fatFs I had mode as device. Now I have host and all works fine. I tried to port your code and it runs without problem. The only thing is that when I put an USB stick it stays on USB_DEVICE_IDLE after checkstatus. What would the problem be? does it otherwise enumerate and work properly? I noticed that the FreeRTOS is not working properly. I copied all your code. I schedule tasks but when I start them, it never goes there (I’m using breakpoints). I can’t understand why ins’t FreeRTOS working. could you halt your target with the debugger and check where it hangs? I think you probably have not allocated enough heap memory so you are in the ‘out of heap’ hook (if not turned off that hook)? I have copied it to KDS and it worked well. but I have a runtime error as below when running Benchmark. this means something went wrong with deleting the file. Have you formatted earlier the device properly? Otherwise this is an indication that something else inside the file operation was going wrong, but hard to tell what. I am using mk64f freedom board. and I want to update my firmware using pen drive or say external flash drive. 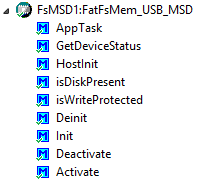 currently I am able to update bin file from PC to system using usb cable using “KinetisFlashTool.exe”, but now I want to update my firmware through Pendrive. I also downloaded the “USB_MSD_Bootloader.bin” file but no results found. I do have such a bootloader for the ColfFire V1 (see https://github.com/ErichStyger/mcuoneclipse/tree/master/Examples/CodeWarrior/TWR-LCD), but I have not ported that to Kinetis because lack of time and I have other research projects to complete first. But in general I would not recommend such a MSD thumb drive bootloader as it is very challenging with different Mac, Windows and Linux systems. I want to implement this demo to mount, open, write and read data from a memory stick, but I really don´t know how to do it without using shell commands you like the ones you have created. As I´m just a newbie with FreeRTOS, I´d like some support from you on how to create my own task, to do this job. P.S: While debbuging I tryed to use FAT1_open, FAT1_write, etc. at USB_DEVICE_INTERFACED case inside the static void CheckStatus(void) polling function, but without any success. are you using that example project? Because this one should work ‘as is’. As for FreeRTOS: there are plenty of example on my GitHub how to create a task already? You would have to debug it with the debugger (use a hard fault handler to make it easier, see https://mcuoneclipse.com/2012/12/28/a-processor-expert-component-to-help-with-hard-faults/. It could be caused by a stack overflow too, so make sure you have plenty of stack space available. About the code I´ve inserted: Is it apparently correct? And is this configMINIMAL_STACK_SIZE define the only place that I have to increase the stack size of this Task? The stack size is specified at the the time you create the task with xTaskCreate(). You can use configMINIMAL_STACK_SIZE, or use something like configMINIMAL_STACK_SIZE+500. Do you know about any example using PE component FSL_USB_MSD_Device linked to an SD working with FreeRTOS. I started working on such a project, but never was able to finish it. I used FatFS for the file system. I still have the project somewhere (for the FRDM-K64F I believe), but I faced problems with the NXP USB stack implementation. 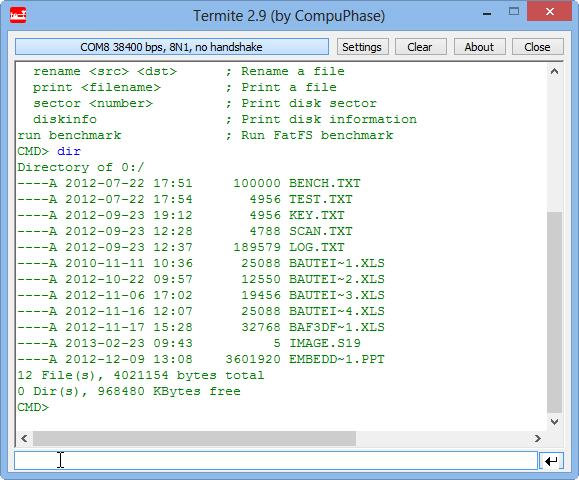 2) I wasn´t able to open a txt file called “PEx_FRDM__K22.TXT”, but I can do it if I rename it, like “TEST.TXT”. So, is there some file naming limitation, as number of characters or special characters? Is there some problem to open a .srec file? you need to turn on LFN (Long File Name Support), otherwise FAT is limited to 8.3 names (8 characters file name, 3 characters extension). Ok, I got it Erich. #error Static LFN work area cannot be used at thread-safe configuration. So, I think something is missing to make this happen. Can you help me on that? This option switches the support for long file name (LFN). When enable the LFN, Unicode support functions ffunicode.c need to be added to the project. The working buffer for LFN occupies (FF_MAX_LFN + 1) * 2 bytes and additional ((FF_MAX_LFN + 44) / 15 * 32 bytes when exFAT enabled. When use stack for the working buffer, take care on stack overflow. When use heap memory for the working buffer, memory management functions, ff_memalloc and ff_memfree, need to be added to the project. 0	Disable LFN. Path name in only 8.3 format can be used. 1	Enable LFN with static working buffer on the BSS. Always NOT thread-safe. 2	Enable LFN with dynamic working buffer on the STACK. 3	Enable LFN with dynamic working buffer on the HEAP. See that it asks to add unicode.c and ff_memalloc and ff_memfree functions. Please, it´s the only thing missing for me to go further with this project at this moment. In the component, under the LFN group, turn on ‘Use LFN’ with ‘Enable, dynamic heap buffer’. Configure the LFN Length to your needs (255 might be to larger for you). And turn on LFN Unicode if you really need it. But where I can find “ff_malloc”, “ff_memfree”,”ff_convert” and “ff_wtoupper” functions declarations to add to the project? and in wich file I should to add this functions? I did not had to add such functions in my code. My next step is to flash a .srec file read from the USB stick based on your serial bootloader example (https://mcuoneclipse.com/2013/04/28/serial-bootloader-for-the-freedom-board-with-processor-expert/). I think I´m not far from this goal, because I already made this project work as well at my side. Can I use your s19 PEx component to do that? My first idea was to read, line by line, the s19 lines and then flash them (again, line by line) to the app region. Do you have any suggestions, or tips for me to do this job, or at least to start it? yes, you could use that S19 component for that. But I would not read and flash line by line: that will be far too slow. Instead, fill up a buffer up to the flash block size and then flash the block as a whole. I do this in the latest version of my serial bootloader. I was trying to merge this example with the Serial Boot with PEx (https://mcuoneclipse.com/2013/04/28/serial-bootloader-for-the-freedom-board-with-processor-expert/) and I´m facing a main problem here: the S19 component apparently was made to receive characters by Console (serially): How do I change this part to read the buffer from a USB Memory Stick (I’ve done the part of opening and reading the .srec file to a buffer and it’s ok)? Maybe just changing the GetChar callback (static uint8_t GetChar(uint8_t *data, void *q) ) or something else? yes, supply your version of the GetChar() callback. failed identification of driver version. I assume you used my project on GitHub ‘as is’? Don’t change the allocation unit size, I don’t think I have that implementend. Have you used different memory sticks? I have found that it did not work with all versions, but it worked very well with older FAT pen drives.